I “met” Jamie Hogan through a (then) correspondence course through the Institute of Children’s Literature. I was technically her instructor, but mostly I tried to get out of a very talented person’s way. I was thrilled a few years back when Jamie was serendipitously paired with another dear friend, Susan Blackaby, for a charming collection of poems entitled, Nest, Nook and Cranny. 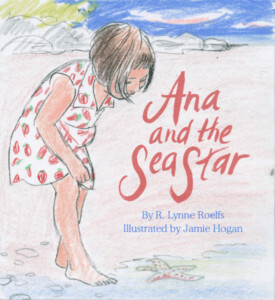 Today we are celebrating Jamie’s latest illustration effort, Ana and the Sea Star, written by R. Lynne Roelfs (Tilbury House; find more information from the publisher here). 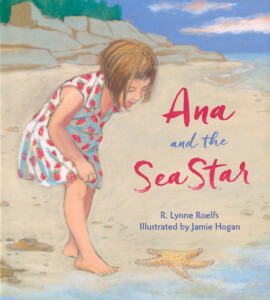 My latest illustrated book is ANA AND THE SEA STAR, written by R. Lynne Roelfs. It’s a rare delight to feature my island habitat in a picture book. This is Roelfs’ first book, and the story is based upon an episode with her family on vacation. Ana finds a sea star at the beach. She wants to keep it, but her father prompts her to imagine where it will go when back home in the sea. Ana and the Sea Star on a Maine beach! Sea stars get stranded here, too, on Peaks Island, Maine. The story felt authentic. I found my own reference and created new ones with an island family as models. I roughly sketched out a visual arc in a single storyboard. I varied the viewpoint while keeping the characters and setting consistent. When I met my models at the beach, I read the story to them and showed the storyboard. They gamely acted it all out. The model for Ana arrived wearing an adorable dress with strawberry pattern, both fun to draw and just the right contrast to all the seascapes. Serendipity! My references combined these photos with shots of island weather, birds, low tides, seaweed, things I documented on my daily island walks. 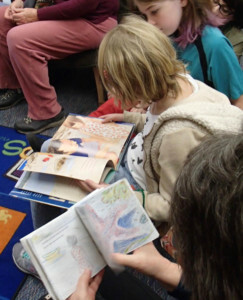 I found books at the local library on sea stars, turtles, and sting rays. Many of my books (like A WARMER WORLD by Caroline Arnold and HERE COME THE HUMPBACKS! by April Pulley Sayre) also required extensive research. I love this aspect of my illustration practice! I crafted a small dummy to send to Tilbury House. A few revisions later, and I began the final illustrations. My work is realistic, but soft-edged, drawn with pastels in vivid colors. I worked on sanded paper, literally like sandpaper and in a color that looks quite like a sandy beach! Working on a warm ground makes the cool blues pop, while the drawing marks have an earthy texture. I began with the title page, leaving most of the paper blank, but drawing Ana hopping with excitement. When making a series that must be visually connected, I work methodically, one page following the next. I saved the cover for last, because by then I was really on a roll. I also teach illustration as an adjunct professor at Maine College of Art, so there were plenty of breaks in the momentum. Yet stepping away often adds perspective to my process. Even a short coffee break or brisk walk can offer a new view, and I’ll notice a refinement that’s needed. Kids at Jamie’s book launch comparing the dummy with the finished book. 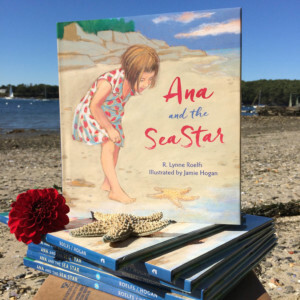 ANA AND THE SEA STAR captures a sweet moment of discovery between a curious girl and nature. It’s just one hop from placing a sea star back in the water to becoming a steward of the environment, which all kids can be. Thanks to Kirby, for mentoring me early in my kidlit journey as my first teacher at the Institute of Children’s Literature. Visual literacy is a dynamic parallel to the word; seizing the power of both remains a delicious challenge for me. Jamie Hogan grew up in the White Mountains of New Hampshire and earned a BFA in Illustration at Rhode Island School of Design. Since 2003, she has taught Illustration at Maine College of Art in Portland, Maine. 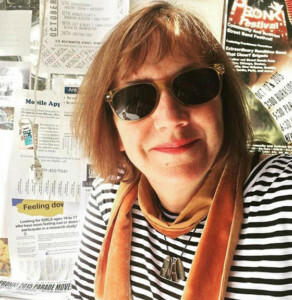 She is the author and illustrator of SEVEN DAYS OF DAISY, and the illustrator of many award-winning children’s books, including RICKSHAW GIRL by Mitali Perkins. She’s a member of SCBWI and the Maine Writers and Publishers Alliance. After chapters in Boston and San Francisco, Jamie has lived on Peaks Island for 25 years with her husband, Marty Braun, and their daughter, who provide endless inspiration along with pink clouds, moon rises, wishing on the first star, and the raw beauty that is Maine. Visit Jamie’s website here; read her blog here; and follow her on Instagram:. Thanks, Kirby for this shout out! Hope you and yours have a wonderful New Year!